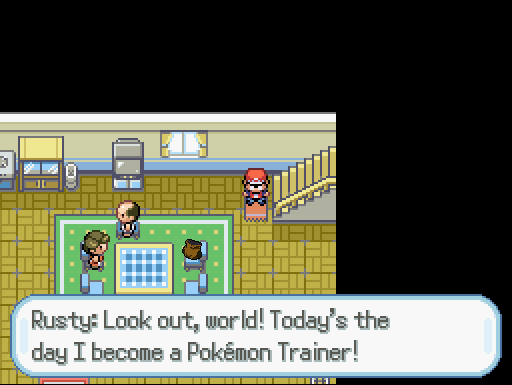 Pokémon Rusty, a game based on a YouTube series made Dorkly. 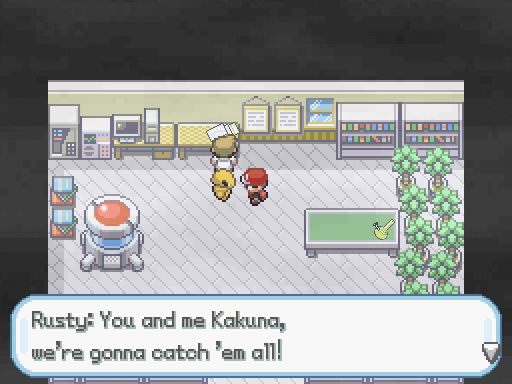 A trainer named Rusty, dumb enough to call his "Kakuna" Pikachu, goes on an adventure to become the very best best trainer. While adventuring to parts of the Kanto Region he accidentally creates the most powerful Pokémon in ever existence, Perfect Bidoof, in which he likes to call Peanut Butter. In order to stop Perfect Bidoof's plan to enslave the entire world, Trainers that Rusty has met gathered, they sent Rusty back in time using Palkia as a base for a time machine in order to stop Perfect Bidoof. Just to be clear, I do not work with the Dorkly Bits company. This map contains areas where there are in-game scenes happening. 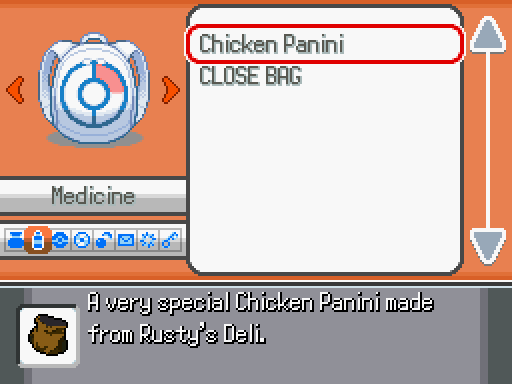 Hey a fan game based on Pokemon Rusty. I'll have to try this out later. Added new Pokémon called Snorcrash. Balanced Encounter and Trainer battles. Demo now ends in "Snorcrash" episode. I decided not to have multiple download links. I shall play it when I get home.------------------------But I am wondering. Do you plan on adapting the whole series into a game? Either way I'm excited to play it. I really enjoyed Pokemon Rusty. Yup! That's what i plan on doing. So I played a bit of your game. It is very faithful to the series it's based on. But I think the grammar, punctuation, and capitalization could use some work. I notice multiple instances where the wrong kind of "your" was used or the letter "i" was lowercase when it should have been capitalized. But you can correct that in future updates. I wouldn't wanna fix those yet, You see i wrote the exact same thing in the subtitles written on YouTube. The exe file will not work when I try to run it. In what way? I can't really help if you don't give a screenshot. It's an RPG Maker game. So simply put, you can't play it on an Android phone. You need a Windows PC. Updated link in the main thread. I just made more progress, so here's more updates. Changed intro scene, so it looks more like the original games now. 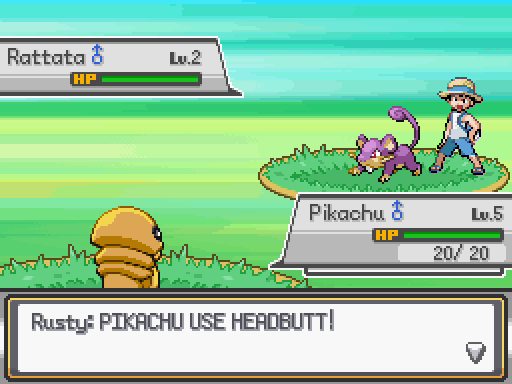 Made the game look more like FireRed. Demo now ends in "Celadon Mall" episode. More grammar fix, the ones that I missed from the last update. Well since I saw this video on YT I was quite inspired to continue and try to finish the game, I also am better at grammar punctuation now. The sign in Beige Town still says "Pallet Town", just thought I'd point that out. I just got through Celadon Mall. Since you worked on stuff like the grammar, and other updates, the game is so much more enjoyable, and it's quite faithful to the original series as well. Really good job. 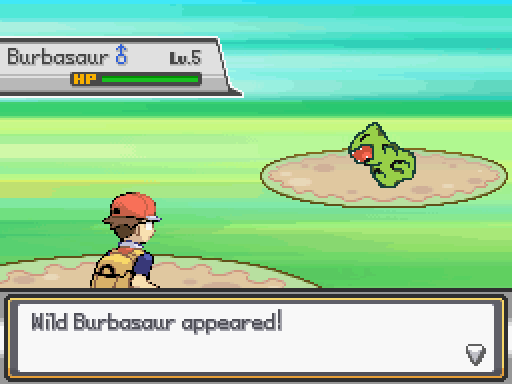 Whenever I enter Route 1, he stops in the first patch of grass and starts saying "No" and then stops moving. 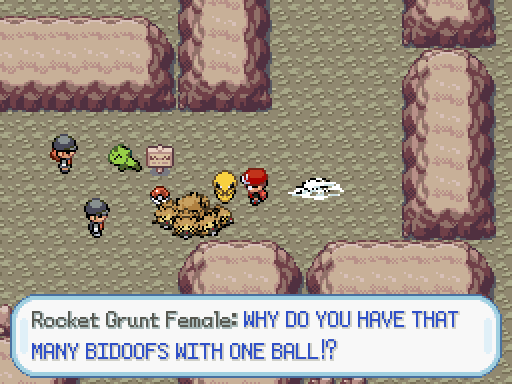 Never recovers from this glitch. Is there any way to fix this? I don't get it, could you try to get a screenshot of it? That glitch isn't on my end so I don't see any problem. Edit: Oops, sorry, my bad, I left an event open. Wait a sec and I'll make a new download link for the game. Edit 2: Ok, now just re-download the game, it should be fine. Another unexpected update because of that. A new bottle graphic added at "Team Rocket HQ". 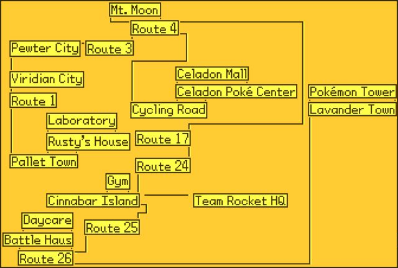 Fixed glitch on Route 1, that prevents progressing through the game. Some improvements on the "Team Rocket HQ" cutscene.
! There is not enough space on the disk. Whenever I try to move the new download I get this error. If I start the game it says RGSS102E.dll could not be found. Thank you for all your hard work! Ok... Huh.. another error, I made sure this time I played the game, my team members have too, but the error isn't happening on our end here, sorry. I can't really do anything about it. Another person reported me that RGSS102E error as well but I don't know how to fix that sorry. I guess try to re-download it again? Or as you say, your device may not have enough space? While you're at it try to get a clean copy of my game without the save file, the save file is located at C:\Users\ACER\Saved Games\Pokémon Rusty just delete the files located there, that's the case if you did save in-game. Quick Note: We will be back to uploading content very soon!